Life is constantly changing. Although it might not feel like it sometimes. It’s very easy to think that we aren’t making any progress in our lives because we get bogged down in the day to day worries of life. We can’t see the bigger picture and see how far we’ve truly come. When I got divorced in 2012 it was probably the lowest point of my life. The year running up to the separation and divorce was pretty horrible too. Six months after leaving a toxic marriage I still felt like I hadn’t made any progress and was stuck in a rut. That was the first time I did a “Self Reflection Day”. Bullet Journal + Self Reflection Day = Awesome! What is a Self Reflection Day I hear you ask? Well, it’s exactly as the name suggests – you take a day (or a few hours) to truly examine your life. It’s a time to see how far you have come and set goals for the future. My first Self Reflection Day was on May 4th, 2013. How do I remember the date? It was the date of the Kentucky Derby and I’ve done a Self Reflection Day on that same day every year ever since! That very first Self Reflection Day wasn’t actually planned or conceived in advance. It was a quiet weekend as my children were with this father. I had nothing to do, so I decided to watch the Kentucky Derby. As I was watching the pre-race show I was reminded of the same race a year earlier. In 2012 I had gone to a friend’s Derby party with my (then) husband. It turned into a horrible day full of arguments and tension. One of those pivotal moments in a relationship when you think, “I just can’t do this anymore”. So a year later when I was watching the Derby again I was able to very clearly compare my life to what it had been like a year before. I grabbed my trusty journal and started writing! I wrote pages and pages that day, outlining all the ways that my life was better (even though things were still pretty bad). Also, I wrote about my goals (more like wishes at that time) for the future and how I wanted my life to be different. It was one of the most cathartic moments of my life…. and yes, I cried… a lot! 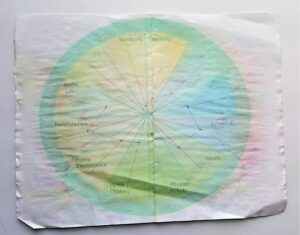 It was also on that day in May of 2013 that I found a Circle of Life chart (also referred to as a Level 10 Life chart). I can’t find the exact same one I found all those years ago and I’m not even sure which website I got it from. Here’s a photo of the one I made all those years ago! As you can see it’s pretty worn and tattered by now, it’s even had a drink spilled on it once. As you can see, my life was decidedly unbalanced at that time! Although it’s interesting to see that I rate my relationship area highest. A divorce has a funny way of strengthening the other relationships in your life – you really learn who your friends are when you go through a divorce! I’ve made a Circle of Life every year since then. It’s always interesting to compare them and see the areas I’ve grown and the areas that still need work. The last couple of years I’ve made my Circle in my bullet journal. I’ve talked before about my love for my bullet journal. I mainly use mine for tracking habits, goals, lists etc. My favorite pages in my current bullet journal are my weight loss spreads and my Christmas planning spreads! 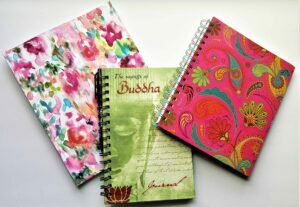 Don’t know anything about Bullet Journals or where to start? Check out my Complete Beginners Guide to Starting a Bullet Journal. As much as I love doing these it is a complete pain in the behind to draw 10 circles without making a mess! Even with a compass, I re-draw the circles several times before being happy with them. I decided this year to make a printable version of the circle so I wouldn’t have to mess around drawing one ever again! And guess what? I’m going to share my printable with you – so you can save time and not have to draw one either! After I filled out the circle I neatly folded it and taped it into my bullet journal. It’s actually kinda fun to slowly unfold it and see the circle inside. For all these years I’ve never known what to call the circle. Sometimes I’d call it a Circle of Life, but that made me think of the Lion King too much! 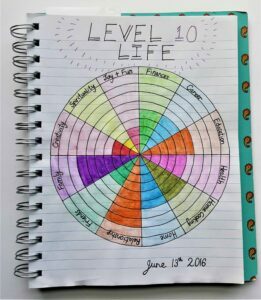 And it’s not really a Level 10 Life circle (see Hal Elrod’s book, The Miracle Morning for more about living a Level 10 life) because I chose to do only 8 areas, instead of 10. 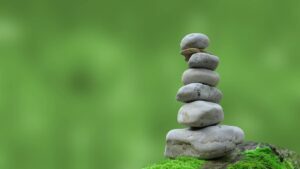 So I picked a new name – The Balanced Life Circle. The idea behind this website is to help parents find balance in their lives. We are all so busy and being pulled in a million different directions, it’s so easy for areas of our lives to be neglected or worse, completely ignored! 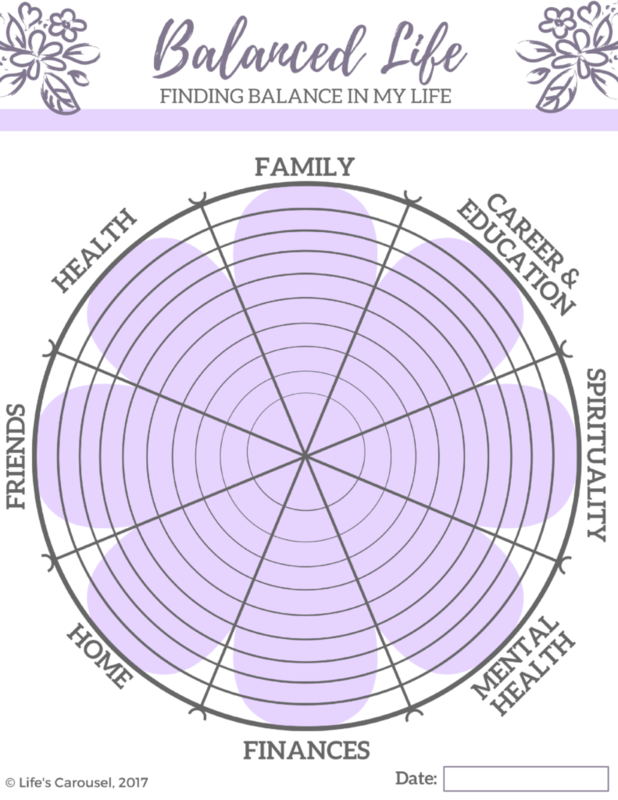 I’ve also created a blank version of the printable Balanced Life Circle, so you can pick which areas you want to concentrate on. 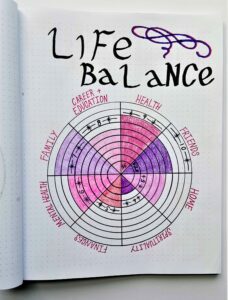 The Balanced Life Circle is very easy to use. Once you’ve printed it out (or drawn your own… good luck! ), you need to carefully think about each area. Take your time and decide what “level” you think your life is at. Once you’ve picked your level you can color in the rings up to that level. Level one starts at the very center, going all the way out to level ten. It can be difficult to decide what level you think you are at. Maybe your finances are doing OK, but they just don’t meet the goals you have set for yourself. It’s all relative! To help you decide what level you are at I’ve created a quiz! It’s 50 questions, covering all eight areas. At the end it will give you a breakdown and recommendation for what level you are at for each of the areas of focus. Having a Self Reflection Day once a year has really helped me appreciate how far I’ve come and plan for my and my family’s future. I’m planning to start having a Self Reflection Day more often. I think once every 3 months would be ideal. I love the change of the seasons, so by syncing my reflection days with the seasons, it will feel like a fresh start every time. Pick a day – it doesn’t matter if it’s once a year, every 6 months or once a quarter, pick a day and schedule it into your calendar. Clear your calendar – This is difficult to do, especially if you have children. Do the best you can to clear as much free time for yourself as possible, even if it’s just for a few hours. 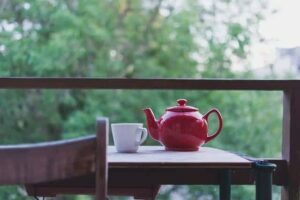 Check out my post about “Finding Time for Self Care” for ideas. Rest & restore – spend some time relaxing and clearing your mind before you dive into your Balance Life Circle. The last thing you want to do is “rate” your life when you are tired and stressed. Try taking a long bath, meditating, doing some yoga or just quietly reading a favorite book. Be flexible – So you’ve picked a day and cleared your calendar, but you get sick or just don’t feel like it when that day comes. Don’t force yourself to have a Self Reflection Day if you’re not feeling up to it. Be comfortable – remember that this day is all about you. So make sure you are comfortable – wear comfy clothes, sit in your favorite chair, have your favorite snack or drink available. The most important thing to remember about your Self Reflection Day is that this is a day for YOU! There’s no right or wrong way to do it. A Self Reflection Day has 2 parts. 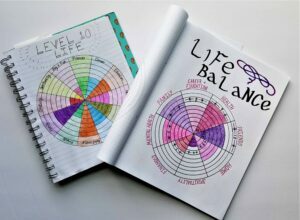 Firstly to reflect upon where your life is now and how far you’ve come (using the Balance Life Circle). And secondly to set goals and make plans for your future. Goal setting is an amazing tool. It really is one of the best kept “secrets” of successful people! Setting goals is a very personal thing but here are a few ideas to help you decide what and HOW you want to improve the eight different areas of your life. There’s no point in deciding that you want to “lose 40 pounds in one month” – that’s not attainable. Or that you want to “get fit” – that’s not measured or specific. Once you decide on the goals for each area of your life, write them in your journal! If you REALLY want to be held accountable to your goals then tell someone about them! It’s much easier to keep on track if you have some people cheer you on from the sidelines! By taking the time to mindfully assess your current life and plan for your future life you will create a brighter future. 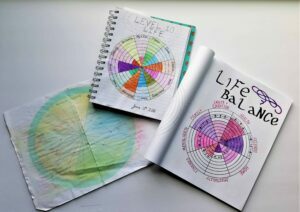 If you would like to receive your FREE printable copy of our Balanced Life Circle, then enter your email address below and we will send it to you! Yours to use for many years to come. Thanks Hannah, I’m so please you like it. Self reflection days have become such an important part of my life now! I love them! That’s awesome Dee. I take this quiz regularly, and I’m often surprised at my scores. We sometimes fixate so much on one thing and think EVERYTHING is going wrong. Learning to separate out the different areas of our lives and noticing where we are doing well is so important.